I’ve sipped from tons of water bottles in my day. In fact, I have about five different ones (various shapes, sizes, and colors) sitting on my kitchen counter at this very moment. 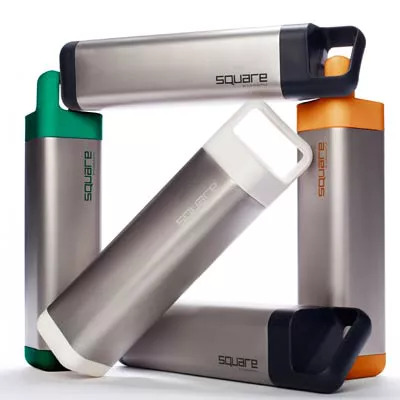 But I think I’m about to give them all the boot for this beauty: The Square by Clean Bottle. I’ve sipped from tons of water bottles in my day. In fact, I have about five different ones (various shapes, sizes, and colors) sitting on my kitchen counter at this very moment. If you’re concerned about whether or not it’ll fit in the bottle holder on your spin bike or treadmill—don’t. I tested it out and it slides in pretty easily to most holders. Another thing, it unscrews from both ends, so you can finally stop worrying about what’s lurking in those hard-to-reach crevices because now you can actually scrub the entire inside. This is especially important considering unclean bottles can be a breeding ground for bacteria. It also has a nice wide mouth, which is lined with BPA-free plastic, so you won’t struggle when you guzzle or experience that yucky metallic taste some reusable bottles often leave behind. Bonus: 10 percent of profits go to one of six charities—Water.org, Engineers Without Borders, Nature Conservancy, Yield to Life, Water 1st, or Team Red, White & Blue—of your choosing. So not only can you reduce your carbon footprint, you can also pay it forward like Haley Joel Osmet’s character Trevor McKinney did. Sounds like the perfect reason to tote your tap in this sleek container.